His Majesty The King granted an audience to the Chief of the Army Staff of Indian Army, General Bipin Rawat, this morning. The general arrived in the country yesterday on a four-day visit. 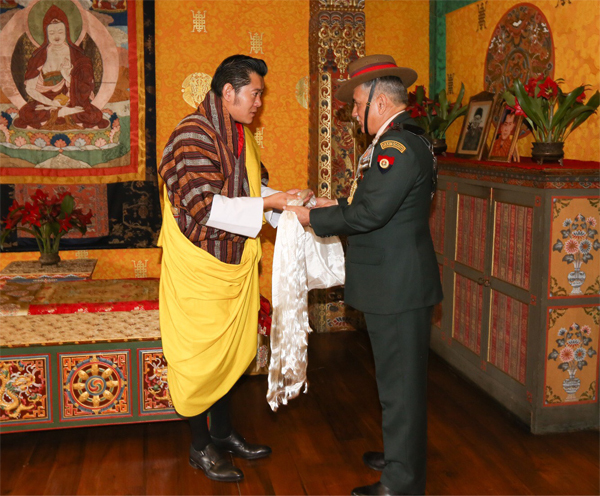 Following the audience, General Bipin Rawat met with the Chief Operations Officer of the Royal Bhutan Army, Lieutenant General Batoo Tshering. General Bipin Rawat was commissioned to the Indian Army in 1978. He assumed the post of Chief of the Army Staff in December last year. He is a recipient of various gallantry and distinguished service awards of the Indian Military. General Bipin Rawat holds a doctorate degree in Philosophy.